Great for For realtors , guests, family ,children after school, cleaning or maintenance services, vacation, pet sitters , for people on the go,never get locked out your home again. Solid construction protects your keys. Your lock box is made of a heavy gauge all-weather zinc alloy. It will resist any attempt to pry or break into the box. No special skills. All necessary mounting hardware is included: 4 screws and 4 nylon expanding wall anchors to ensure that the Key Safe can be mounted on any solid surface. The lock box also includes a detachable weather-resistant rubber cover for even more protection from snow, ice, and rain. 1.Passcodes do not need to be entered in the correct sequence. For example, a passcode of 12345 can also be entered as 54321. 2.It's NOT recommend to use combination such as "A-A-A-A", otherwise it might be easily cracked. 4.DO NOT forget your own password. ▶ Convenient : No special skills. All necessary mounting hardware is included: 4 screws and 4 nylon expanding wall anchors to ensure that the Key Safe can be mounted on any solid surface. ▶ Security : This key storage lock box is made of zinc alloy and heavy-duty construction, which can protect the box from hammering, sawing or prying. so your key can still stay secure ! ▶ Capacity : This key safe lock box is solid construction，works well and has plenty of capacity to store the items you need access to. Internal size: 2.8 x 1.6 x 0.98 inch; Outside size: 4.13 x 2.55 x 2.16 inch . ▶ Indoor / Outdoor use: Recommended for Realtors, Rental Properties, Property Management, House Owners, Grandparents, Kids, Caregivers, or Pet Sitters . 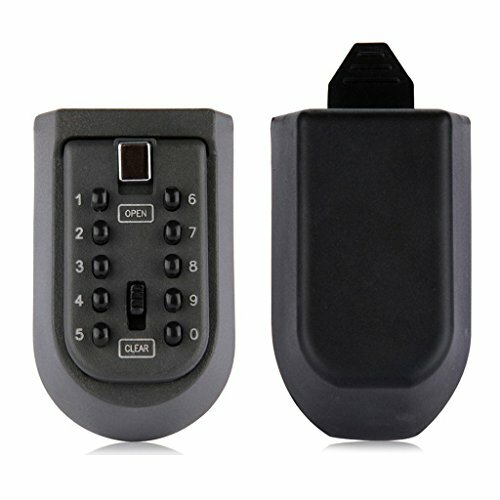 ▶ Guarantee : Best key lock box- Get 100% SATISFACTION -If you are not satisfy with our product simply let us know for a full and prompt replacement or refund. If you have any questions about this product by Qeri, contact us by completing and submitting the form below. If you are looking for a specif part number, please include it with your message.